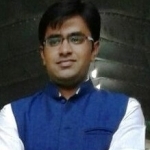 Ashutosh Tikekar from Ujjain, B.Com Graduate. DOCUMENTATION AND RE.. CASE MANAGEMENT COUNSELLING LIASONING & COORDINA.. LIASONING WITH GOVT... EVENT MANAGEMENT PROJECT PLANNING AND.. BUDGETING RESOURCE MOBILISATIO.. INTEGRATED CHILD CAR..
are one of expert skill area's of Ashutosh Tikekar . Ashutosh Tikekar is working in Others industry.